Kastav Kvinchal is an Imperial commoner living with his siblings, brother Vlanarus and sister Bronsila, in a shack in the Imperial City's Waterfront District; however tensions among the three are high. Kastav works for the Imperial Trading Company as a dockworker. According to his brother, Vlanarus Kvinchal, he is extremely lazy. True to his brother's accusations, Kastav spends very little of his life working. He sleeps from 10pm to 6am in the family shack, and will only leave the house at 9am to wander around the slums for an hour. He has a two hour meal at 9pm, and the rest of the day he lounges about the shack. There are a few exceptions when Kastav is forced into action. During Light the Dragonfires, he will stay inside the shack until the Daedric invasion is halted. During Misdirection he will either be confined again to the shack by the Imperial Guards, or he will actually go to work for once and will help out around the Imperial Trading Company Warehouse from 8am to 5pm before resuming his usual schedule. 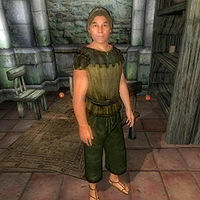 Kastav wears a lower-class outfit consisting of a flax tunic, green felt linens, and a pair of sack cloth sandals. He wields an iron dagger, carries the key to the Kvinchal shack, as well as a few pieces of gold. When you first speak to him, Kastav will introduce himself with: "I'm Kastav Kvinchal. And, if you listen to that witch of a sister of mine, Bronsila, I'm also a dog and a pig." Asking about the city will lead to him explaining his work: "I do my part on the docks, just like Bronsila and Vlanarus. Why should I kill myself? They don't pay me any more. For what I get paid, I work plenty." Kastav is indeed correct, although it is his brother Vlanarus who will do the bad-mouthing: "Kastav says he works. Ha! Flies land on him, he's too lazy to brush them off. I'm sick of taking abuse for him, even if he is my brother." and he will add: "Kastav is my brother, all right, but I'm nothing like that deadbeat." This page was last modified on 26 December 2017, at 21:01.